Graduate students in search of a dissertation topic—or even more advanced scholars looking for a fresh scholarly pursuit—might want to consider the many stage lives of Joan of Arc, an admittedly broad collection of texts, but one so far largely understudied as an example of dramatic medievalism. There is even a subgenre of Jehane films in which characters establish their acting credentials by playing Joan—The Miracle of the Bells, Nachalo, and The Little Drummer Girl, to name only three such films. Joan’s legacy remains a medievalist’s dream, or nightmare, depending upon one’s perspective, as she has become a saint in a church that at one point burned her at the stake, the mother of a nation, and the darling politically both of the left and of the right— her name has been used, misused, confused, and even abused in the service of any number of, at times conflicting, causes and ideologies. The casting of a mixed race teenager to play Joan earlier this year in festivities held in Orléans prompted such a level of abuse and outrage on social media by members of the French far right that a French state prosecutor opened an inquiry into their response on the grounds that it amounted to an incitement to racial hatred. Joan’s stage life begins in 1435 in a mystery play of some 20,000 lines of verse with speaking parts for more than a hundred characters, Le Mystère du siege d’Orléans. Shakespeare would take a decidedly less sympathetic view of Joan in Henry VI, Part 1 casting her as a sorceress repudiated by her own father; Voltaire would use her as the subject for an at times scurrilous mock epic; and George Bernard Shaw would turn her into a proto-Protestant. In addition, Joan would inspire a lengthy list of playwrights, each with his or her own agenda: Friedrich Schiller, Jules Barbier, Alexandre Soumet, Charles Péguy, Percy Wallace MacKaye, Maurice Maeterlinck, Jean Anouilh, Bertolt Brecht (more than once), Maxwell Anderson, Jules Feiffer, Lanford Wilson, Richard Nelson, Carolyn Gage, Julia Pascal, Erik Ehn—and even a short-lived Broadway musical, Goodtime Charley, and a more recent rock opera, Joan of Arc, Into the Fire—though Joan has had more staying power as the subject of several more mainstream operas. And playing Joan has proven the definitive role for many actresses as evidenced by Playing Joan, Holly Hill’s 1987 collection of interviews with those who have assayed Shaw’s Joan. 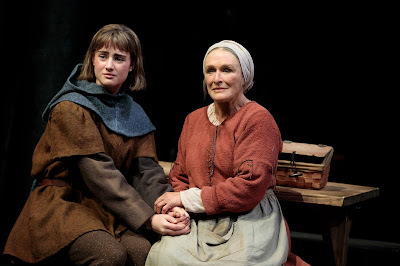 Jane Anderson’s Mother of the Maid—first produced three years ago in Lenox, Massachusetts, by Shakespeare & Company, and now on stage in a revised version at Manhattan’s Public Theater—offers yet another take on Joan, in this case through the eyes of her mother, played by the estimable stage and screen actress, Glenn Close—Jane Anderson also wrote the screenplay for The Wife, Close’s current film. Isabelle Romée (ca. 1377-1458) was born in Vouthon, a village not far from Domrémy. She married Jacques Darc (1380-1440), a farmer who held a number of civic offices in the area, and gave birth to five children, two daughters and three sons, all of whom were reared in a typically pious late medieval household. After Joan’s death at the stake in 1431, her mother moved to Orléans, whose citizens provided her with a pension in gratitude for Joan’s deliverance of the city in 1429. In 1455, Isabelle and her two sons, Jean and Pierre, would become the plaintiffs in the case brought before the Church that resulted in the nullification of the 1431 verdict that had condemned her to death at the stake. Anderson’s play opens after Joan (Grace Van Patten) has already had her visions of St. Catherine of Alexandria and is ready, to the consternation of both her mother and her father (Dermot Crowley), to go off to meet the Dauphin to explain her divinely inspired mission to him. Her mother is baffled and bewildered by her daughter’s actions, while also less than secretly proud of them. Her father is less so, but his attempts (literally) to beat some sense into his daughter are for naught. In the course of the play, Joan’s victories and defeats play out in terms of encounters with her mother, who visits her at the Dauphin’s court, at the great Cathedral of Reims on the eve of the coronation, and even in her prison in Rouen just before her execution. How historically accurate such scenes are is beside the point, as the play attempts to fathom the reactions of a mother to her soon to be martyred daughter, a daughter more written about than perhaps any other woman in western civilization—in his novel about her, no less a light than Mark Twain would conclude that she “is easily and by far the most extraordinary person the human race has ever produced.” In Mother, Joan is part embryonic saint, part rebellious teenager—her mother wonders if her visions are simply a sign of the onset of Joan’s puberty. The dialogue throughout is down to earth, even at times profane. The Darcs are a sturdy lot, tied to their land, and ferocious in their devotion to Church and state, both of which will, of course, repay that devotion with betrayal, a point not eventually lost on Joan’s mother, who has the last word in the play recounting how she managed to cope with what had happened to her daughter. The Church here is represented by the well-meaning parish priest, Father Gilbert (Daniel Pearce), and the secular powers by an unnamed Lady of the Court (Kate Jennings Grant), equally well-meaning but, more often than not, clueless and scatter-brained in stark contrast to the decidedly less-pampered and formidable Darc women. Just as Joan inspired a nation on a grand scale, she also inspired her mother who learned to read and write, who would go to Rome to confront the pope, and who, during the nullification trial, took on those who had had the temerity to condemn and execute her daughter. Since, thanks to the exhaustive transcripts from her two trials, we already know so very much about the details of Joan’s all-to-brief life, it might have been more interesting to have had a play about her mother’s life after Joan’s death as a testimonial to the remarkably fierce woman who was mother to an even more remarkably fierce daughter. But the play as we now have it is, nonetheless, a wonderful piece of theatre, and a fine vehicle for Close and her fellow cast members. John Lee Beatty’s simple, functional set easily transforms from farm house, to castle chamber, to prison cell. Jane Greenwood’s costumes are period appropriate, Alexander Sovronsky’s score adds some fine musical touches to the dialogue, and Matthew Penn’s direction knows when to allow his actors to trust their own instincts.daughter. Mother of the Maid, written by Jane Anderson, directed by Matthew Penn, scenic design by John Lee Beatty, costume design by Jane Greenwood, lighting design by Lap Chi Chu, original music by Alexander Sovronsky; with Glenn Close, Dermot Crowley, Olivia Gilliatt, Kate Jennings Grant, Andrew Hovelson, Daniel Pearce, and Grace Van Patten; at Manhattan’s Public Theater—Oskar Eustis, Artistic Director—from September 25, 2018.